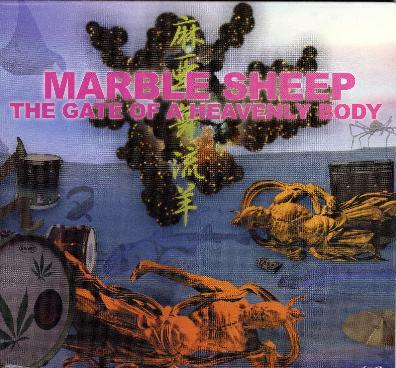 Marble Sheep - "The Gate of a Heavenly Body"
Marble Sheep are from Japan, have been making music since the late 80's and they have released a lot of material. The band is going on tour in March in Europe and will play at Loppen in Christiania on Friday March 24th. Anyway, this CD features some high octane garage rock meets psychedelic freakout music. The band is much more consistent than their freak brothers, Acid Mother's Temple, who are pretty much over the top insane most of the time. The CD can go from total over the top freak out stuff to quite melodic stuff with really great lead guitar by Ken Matsutani (owner of Captain Trips Records). We get 8 tracks in about 40 minutes in a beautiful fold out digipack. The band packs the most impact though when going to the edges of listenable music but not too far and really creating a psychedelic whirlwind. Quite an experience. For more information you can visit the Marble Sheep web site at: http://www.soho-net.ne.jp/~ohr. Visit the Fuenfundvierzig web site at: http://www.fuenfundvierzig.com.